Garage Doors in Gatineau | Portes de garage Domac inc.
Day in and day out, your garage door is exposed to the elements. Just a few years of the intense rays of the sun, pounding rain, and damaging hail can wreak havoc on your door. At Portes de garage Domac Inc., our customers are delighted to admire how their garage doors stay looking like new even after numerous years of use. We are proud to carry garage doors and garage door openers that are reliable and made to last at Portes de garage Domac, Inc. Sometimes, a garage door can be accidentally damaged. Or, even if nothing abnormal occurs, you still need to perform regular preventive maintenance. In either case, our technicians have all the years of experience and knowledge needed to take care of any garage door issue, precisely and efficiently. At Portes de garage Domac Inc., our technicians are garage door specialists. They have been installing garage doors for many years and know more about them than anyone in the industry. As well, they are hard workers, friendly, and happy to give advice. Whether for the installation of a garage door or a garage door opener in Gatineau, our technicians are ready to assist you. 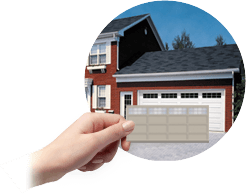 At Portes de garage Domac Inc., we have put everything at your fingertips to help you choose your new garage door. 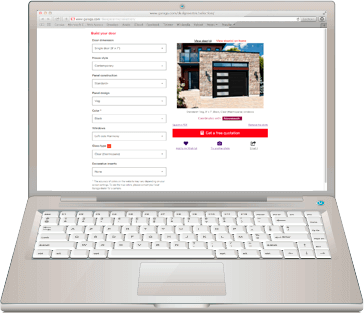 Try out our Design Centre and see how easy it is to coordinate a garage door with the exterior of your home. There is no end to the possibilities, and you can see the results in just a few clicks. Have a look and discover the results for yourself! Not only can our experts guide you on the best garage door for you, but also on the best garage door opener to choose for your needs in Gatineau. A garage door isn’t a routine purchase. In fact, most of us will only buy one or two in our lifetimes. Naturally, we all would like to make the right choice and having someone to guide us through the array of options, models, colours and styles would be invaluable. Our garage door specialists will be glad to assist you through this process. Once you have chosen a new garage door suited to your taste and needs, we can advise you on a proper garage door opener as well. Gatineau is one of Quebec’s largest cities and we would like to ensure that each of the city’s 270,000 residents is fully satisfied with their garage door and garage door opener. At Portes de garage Domac Inc., we always ensure that our customers have access to the best products on the market, meaning those that are long lasting, efficient and safe. This is why we proudly carry LiftMaster garage door openers, because they are quite simply the best. LiftMaster garage door openers safely and securely eliminate the need to manually open and close your door. You are assured that your garage door is operated correctly, while keeping you and your family protected from the inclement weather we can experience in Gatineau. If you are experiencing problems with your garage door system, do not try to repair it yourself. One reason is that spring components are under extreme tension and potentially dangerous. Let our knowledgeable and dedicated specialists at Portes de garage Domac Inc. put your door back into top working order and give you peace of mind. 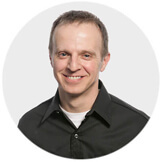 Contact us when you have any problems with your garage door in Gatineau. Our employees will tell you exactly what you need and they will replace or repair any defective parts for your garage door or garage door opener. Gatineau, Chelsea, Luskville, L’Ange-Gardien, Mayo, Thurso, Lochaber, Lac Mc Gregor, Sud de l’Outaouais et dans les environs.